Marine plywood has actually less to do with the wood species as it has with the specs to which it is manufactured. If we look at the ‘wood specie’ first. Most marine plywood in the world is made from the Okoume (Acuomea Kleinea) tree which is cut in the African country of Gabon in the tropical forests of the Congo Basin. This wood is also often referred as Gabon, Gaboon, Okume, Ocume, Ocoume, BS1088 etc. And the plywood core as well as the face veneers are made of the same wood. In China most okoume plywood core is poplar, a very common wood specie in China. Virtually all Okoume plywood is manufactured outside of the U.S. so it is a good bet that the plywood in your kayak will likely come from some sawmill in China or Indonesia. Another less common variety of marine plywood is ‘Meranti’. It is made from many subspecies of the ‘Shorea’ tree species which also happens to be the source of wood for the common Lauan (luan) plywood. Both Lauan and Meranti plywood are also referred to interchangeably as Philippine Mahogany and the wood is harvested in Indonesia and its neighbouring countries. Now, there is also White Lauan and Red Lauan which happens to be the Red Meranti. Other ‘Meranti’ plywood is made from Shorea curtisii, S. hypochra, S. leprosula, S. multiflora, S. platiclados, S. pauciflora to name a few. Marine plywood is also made from Fir, Ash, African Mahogany (Kaya), Honduras Mahogany and/or combinations of Okoume core with Sapele, Teak as well as other wood veneers but those are largely used on plywood thicker than 4mm which is not usable for kayak builders. 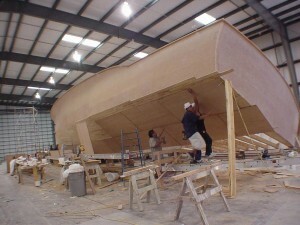 Now, the main thing that entitles plywood to be classified as ‘marine’ relates to the manufacture under a set of standards, specifically to the quality of the wood as in the number and size of permissible knots and cracks, glue type, moisture content and thickness tolerances of the veneers etc… Marine plywood is sold under BS (British Standard) designation BS1088 and BS6566. BS1088 is made from Okoume and is of the highest quality with a defect free core and both faces of solid A surface while BS6566 standard is less species specific and is more permissive so the surface of this plywood may show a few skin defects on one or both faces. Plywood BS1088 standard on Wikipedia.